Who Is PetSafe Smart Feed For? The PetSafe Smart Feed is the feeding solution for the modern dog owner. No matter if you are at work, stuck in traffic or even busy around the house, you can have the power to feed your dog right from the palm of your hand using your smartphone. The Smart Feed is a WiFi enabled feeder that connects to your home’s wireless router (2.4GHz) and works with your Android or Apple Smartphone. The Android needs to be 5.0 or later and the iPhone needs iOS 9.0 or later. It will also work from an iPad. 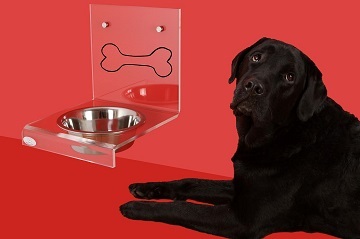 It will allow you to feed and monitor your dog’s meals at anytime or from anywhere. The unique conveyor design dispenses most shapes and sizes of dog food and the pet proof dispenser keeps dogs from sneaking food out of the container. Once you download the free app, you will be able to program your dog’s food schedule right from your phone. You will also receive alerts on your phone if the Wi-Fi is lost or if the feeder is offline along when your dog has been fed. One feeder can be controlled from multiple family members’ smartphones and multiple feeders can be controlled from one smartphone. You can customize your dog’s feedings up to 12 meals and the amount you are feeding your dog from 1/8 cup up to 4 cups at a time. They offer a unique slow feed option that allows food to dispense slowly over a 15-minute period to help with dogs that gulp their food down. The food hopper holds up to 24 cups of dry or semi-moist food, and is dispensed into a 5 cup capacity stainless steel bowl. The unit is easy to clean, with the lid, hopper, bowl and bowl holder all being safe for top-shelf dishwasher cleaning. The unit measures 9.4″ wide x 20.3″ long x 12.6″ high. There is also an optional battery backup that the unit comes equipped with that can work for up to 7 days of feeding. A great feature if there is a possible power outage, to make sure your dog is still getting their meals. Batteries are not included. Pro #1: Flexible Portions – Food can be dispensed from 1/8 cup up to 4 cups. This is a larger feeding capacity than most feeders. Pro #2: Slow Feed Option – Allows food to be dispensed slowly over a 15-minute period. This can help with a dog who gulps his food down in preventing them from later vomiting or causing dog bloat. Pro #3: Dry or semi-moist food. Most automatic feeders aren’t capable of serving semi-moist dog food. Pro #4: Customizable Meal Times – You are able to set up to 12 meals to be fed during the day and you also have the Feed Now Option that you can use either directly from your phone or from the unit directly. Pro #5: Large food storage capacity. The hopper will hold up to 24 cups of dry or semi-moist food. This is a larger storage than most other automatic feeders provide. Con #1: If your WiFi goes down, you won’t be able to reconnect automatically. You will need to manually reset the feeder. Con #2: Doesn’t currently work with Alexa or other virtual assistants, but they are working on that. No time frame at this point for its availability. Con #3: Indoor use only. Con #4: Can’t use wet or canned food. As long as your are feeding your dog or cat dry or semi-moist food, it should work well for your pets. This is what is included with your purchase of the Smart Feed. Don’t make your dog wait around for you to get home before feeding them. Android Smartphone 5.0 or later, or an iPhone with iOS 9.0 or later. You can call customer care for live help and questions at 1-866-738-4379 Monday – Friday from 8 a.m.-9 p.m. ET or Saturdays 9 a.m. – 5 p.m. ET. There is also an online help database available. PetSafe offers a 1 year non-transferable limited warranty that your product is free from defects in material or workmanship to the original owner. It covers labor and parts. They also offer that if you are not completely satisfied with their product, you can return it within 45 days for a refund of the purchase price. They do not cover shipping costs. I do believe that care always needs to be taken whenever we are away from home with regard to our pets. If you have a dog that most times doesn’t have any issues when they eat their food with vomiting or getting food stuck in their throat, then I think the PetSafe feeder is a great investment to make. It will give you the reassurance that your dog is always getting fed when they should be fed, even if you are running behind schedule. It will also be something that could help your dog with boredom while you are gone, since they will quickly learn their feeding schedule, and will be waiting for their meal to arrive. If you have a pet that sometimes struggles with their eating by either coughing their food back up or sometimes vomiting after eating, this might not be for you. You supervising them while they eat, might be a better choice. I do recommend the Petsafe Smart Feed for automatically feeding your dog. I think that as people are busy with work, family and other activities, that smart dog feeders are going to become more popular for dog owners. I feel that from this PetSafe Smart Feed Review you should have your questions or concerns about this product answered, but if you still have questions, please leave them below. The only real concern that I have with this product would be for cat owners. Many times people will leave their cats for several days, and the cats will be fine. If you are feeding your cat with any automatic pet feeder that requires WiFi, you never know if the WiFi could go out for some reason, and now your cat doesn’t get fed. Please leave any comments or questions below. You can follow justforyourdog.com on Pinterest, FaceBook or Twitter for all the latest dog updates.